After the Great Recession ended in 2009, the number of people employed in the U.S. began rising steadily (again) in early 2010, and has set historical “records” every month since mid-2014. 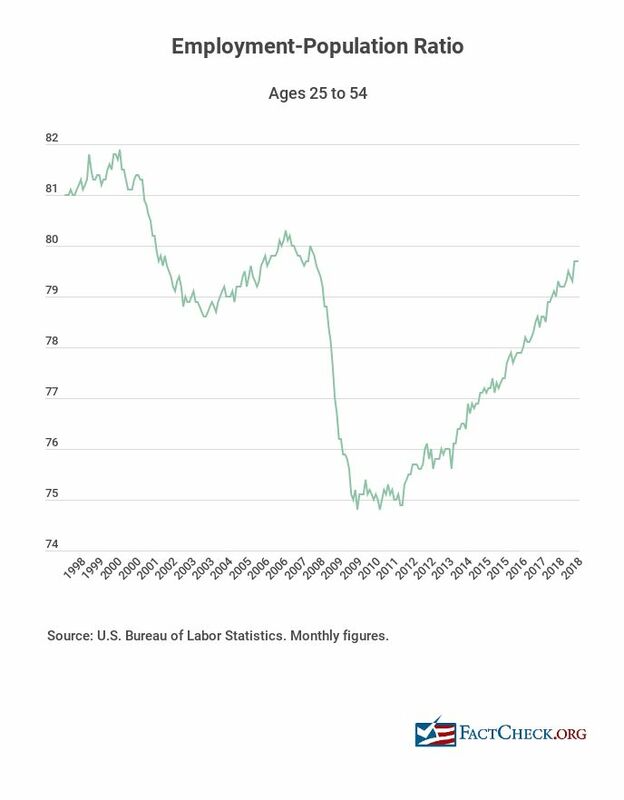 The number of people working in the U.S. has increased fairly steadily for as long as such figures have been tracked by the Bureau of Labor Statistics. That’s to be expected as the population rises. There have been exceptions, notably during recessions, when the number of people employed has declined even as the population increased. That’s what happened during the Great Recession. The chart below shows the number of employed people starting in December 2007, the start of the recession. The red part of the line shows the periods under George W. Bush and Trump. Before the effects of the Great Recession, the number of people employed reached a peak of 138.4 million in January 2008. That was the highest number of employed since 1939, when the Bureau of Labor Statistics began tracking this figure. The number then steadily declined until February 2010, at which point it began an increase that continues today. The number of people employed reached the previous 2008 peak in May 2014. 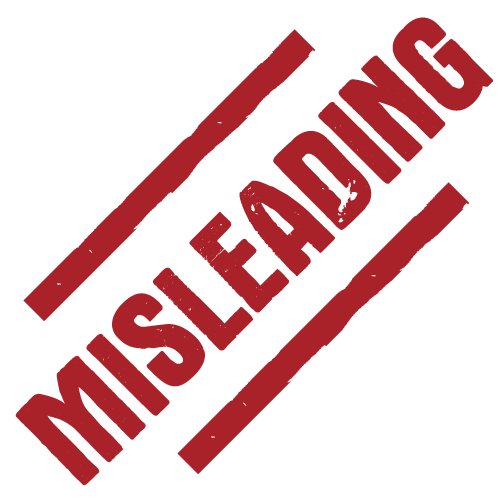 That month, then-President Barack Obama could have correctly claimed that there were more people employed in the U.S. than at any time in the country’s history. In fact, as the number of employed continued to rise every month until the end of his presidency, he could have made that claim in 32 straight months. But we could find no evidence that he did. Thanks to population growth in the U.S., most every president could claim to have presided over a record number of employed. Nonetheless, that hasn’t stopped Trump from frequently boasting about this hollow milestone. In our search of Trump’s past comments via the website Factba.se, we found more than 20 instances dating back to September 2017 in which Trump bragged that there were more people employed than ever before in U.S. history. “That’s a big number,” he said on Aug. 7, 2018. “An amazing statistic,” he said on Nov. 2, 2018, a day after he called it “a tremendous statement.” “How good is that as a sound bite?” he said on Oct. 27, 2018. It might indeed make for a good sound bite, but it isn’t as “amazing” a statistic as Trump makes out. Since Trump took office, the U.S. population has grown by more than 4 million people. One would expect that “record” to continue to be broken as the population increases. And it has. It is more meaningful to take population into consideration, and there are several ways do that. Another measure is the employment-population ratio, which is the percentage of the population that is working. 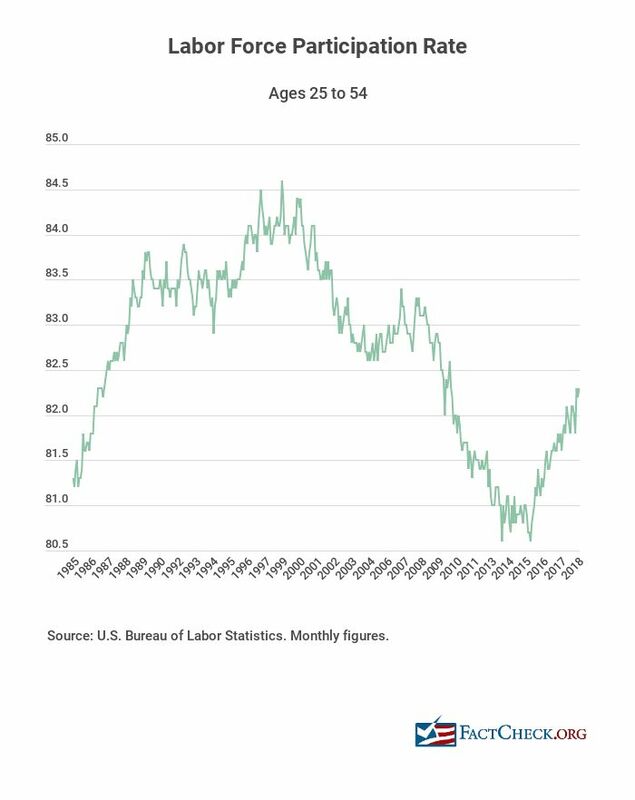 Looking again at that statistic just for those ages 25 to 54, the ratio has been steadily climbing since 2011, and was at 79.7 percent in December. But that’s not a record high either. It peaked at 81.9 percent in April 2000. 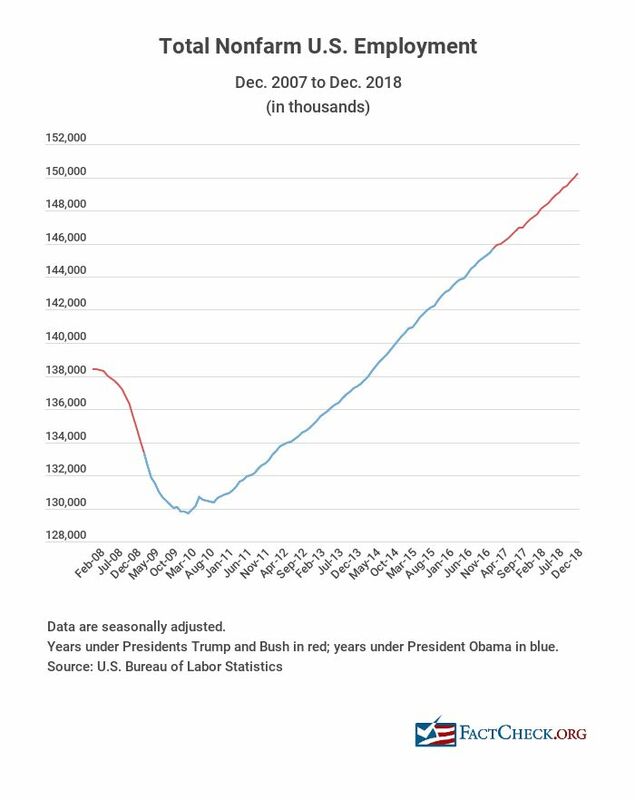 There are other figures the president could cite to support his claim that “the economy is doing great.” But pointing to the fact there are more people working now than ever before, without taking into account rising population, isn’t one of them. "More people working in U.S.A. today than at any time in our HISTORY. Media barely covers!"